The development of breast cancer is a complex phenomenon that requires a number of genes and molecular pathways. The disease is a synergistic interplay of genes and pathways and only a combination of drugs that targets these genes and pathways will be effective. Breast cancer patients are usually treated with a combination of different modalities spanning from surgery and radiation treatment to chemotherapy, hormonal therapy and targeted treatment depending of type and stage of disease. The degree to which the treatment is tailored to the individual patient depends on the type of treatment. We, in our group study how the epigenetic characteristics of the tumor influence the tumors response to therapy. Anthracyclines and taxanes represent the most active agents used in breast cancer. Neoadjuvant chemotherapy regimens have been extensively used in the treatment of locally advanced breast cancer, before surgery to allow surgical resection/mastectomy with acceptable margins, and to ultimately extend survival of the patients. Despite the improved results obtained by more aggressive and individual response tailored therapy, patients with large tumor still have a less favourable outcome compared to patients diagnosed with smaller tumors. Whether antiangiogenic treatment strategies as bevacizumab may improve the tumor response and eventually the prognosis for these patients, is still unknown. patients- assessed as serum cytokines levels? 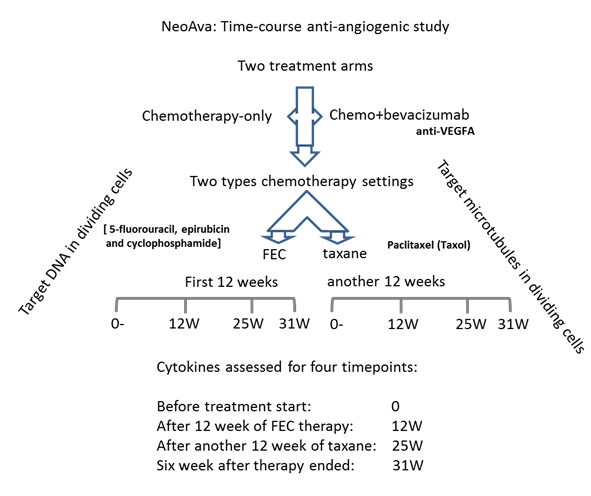 Anti-angiogenic drug bevacizumab lowered the concentrations of its target VEGF-A to the least when combined with anthracycline-containing regimen FEC as neo-adjuvant chemotherapy in this breast cancer time course treatment study. Anti- VEGF-A therapy not only lowered the serum levels of VEGF-A but also diminished the levels of direct or indirect regulators of VEGF-A. Figure 5. Cytokines levels assessed at four timepoints in breast cancer patients from two treatment arms: control or chemotherapy-only (chemo) arm, and chemotherapy plus bevacizumab (Bev) arm of treatment (unpublished). 1. Jovana Klajic 17.06.2014; Title of the thesis: From normal breast to invasive carcinoma: DNA methylation profiling of stage and response to chemotherapy. 1. DNA methylation status of key cell-cycle regulators such as CDKNA2/p16 and CCNA1 correlates with treatment response to doxorubicin and 5-fluorouracil in locally advanced breast tumors. 2. Differential DNA methylation analysis of breast cancer reveals the impact of immune signaling in radiation therapy. 3. 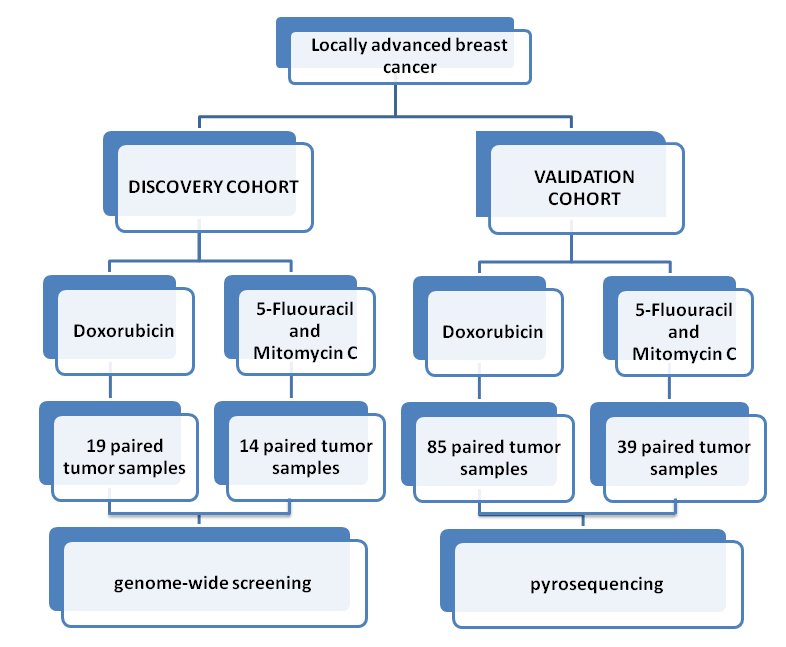 DNA methylation profiling in doxorubicin treated primary locally advanced breast tumours identifies novel genes associated with survival and treatment response.